Amsterdam -October 9, 2008-Tizio BV today announced MyM 6.2, the next major release of the MyM modelling environment which seamlessly integrates visualization, application and presentation of simulations of dynamic models. 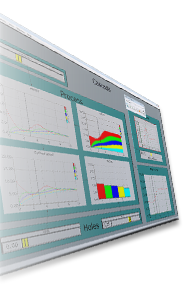 MyM 6.2 is a completely renewed and modernized integrated environment for the development, visualization and application of simulations of dynamic systems is introduced. MyM is developed by Tizio B.V. in cooperation with the Netherlands Environmental Assessment Agency (PBL). Easy to use: Without the help of a programmer, large simulations with easy-to-use graphical interfaces can be built. You simply write down the mathematical equations and you can build a graphical user interface yourself by drawing graphs and charts on a canvas. They are directly available for inspection. Debugging: The full history of all variables is directly available for inspection, as are the equations and their documentation. This makes MyM models more open to inspection and much easier to analyze mathematically. Speed: MyM models are not interpreted but compiled, causing simulations in MyM to run much faster than other simulation packages. Cost: MyM provide modelers all the tools to design, create and present a simulation model to others. By eliminating the need for external programmers and designers, the costs for development are greatly reduced. Free distribution: Distributions of models made my MyM are free of license fees. You can distribute your MyM model applications for free to your colleagues or customers. MyM is suitable for large dynamic models MyM is being used by an increasing number of scientists who develop national and global models of the public health and environment, such as Fair and Targets. MyM is also successfully used to build user interfaces for existing models such as IMAGE 2.1. To order MyM or register for a fully functional 30-day trial of the MyM software go to www.my-m.eu or contact our MyM Sales Team.